I made cookies today. cookies with fruit. they are delicious. a light, moist cookie with an orange glaze on top that will make for a lovely snack or after dinner sweet. my oranges were getting soft and I had seen this recipe on foodgawker, so I figured there was no better time than now to use them up. 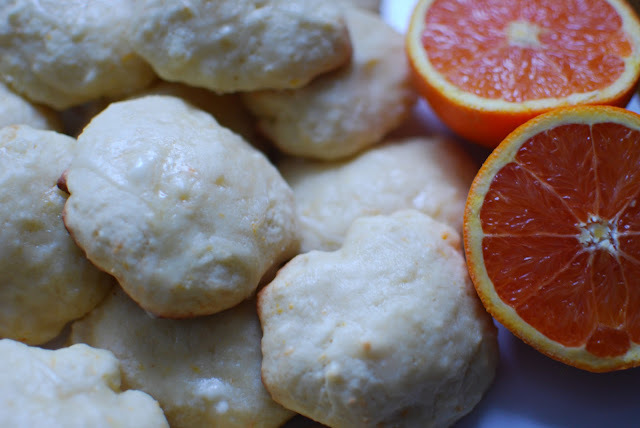 I used cara cara oranges, which are sweeter than a regular orange. I used orange juice in the glaze and omitted the orange zest because I had used up all my oranges in the batter, but it didn't make a difference in the flavour. my hand mixer died recently so this was all manual labour! let me tell you, I cannot wait for the day I am not a student anymore and can have a kitchenaid stand mixer. I dream about it every day. in a bowl, cream butter and sugar. add sour cream and eggs and mix until wet. add remaining ingredients and stir until mixed. drop in spoonfuls on a non-greased cookie sheet and bake for 10 minutes at 400*C, until golden around the edges. glaze while warm. a month from today I'll be done my fourth year at carleton! big plans for this summer: including traveling to italy to eat wonderful food (oh and sightsee!) and hopefully constantly keeping up with this little blog! I hope the sun is shining and spring is coming wherever you are. until next time, happy making!